Today’s defence related news includes coverage of a new joint venture in military vehicle development and Op Shader. The Telegraph, Daily Express, FT, The Times, Daily Mail, The Sun and The Scotsman all note that BAE Systems and Rheinmetall have signed an agreement to create a joint UK based military vehicle design, manufacturing and support business. The new joint venture will be headquartered at BAE systems facility in Telford, England and will sustain over 400 jobs in the UK. This decision is a clear vote of confidence in the UK’s defence sector as a world-leader in making military combat vehicles. This news brings a whole host of potential benefits for hundreds of British jobs, British exports and opportunities for new equipment for the UK and our international allies. The Daily Mail reports on the RAF's air power as part of Op Shader's efforts to defeat Daesh. The UK remains fully committed to the fight against Daesh, and the retirement of the Tornado will be not lead to a reduction in the capability of the RAF’s contribution to the Global Coalition. 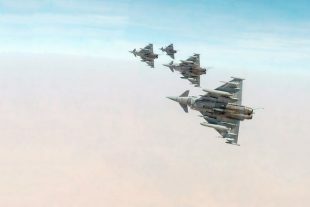 The integration of the full range of ground attack capabilities onto the Typhoon has now progressed to the point where they can replace Tornado on Op Shader in the near future. 2018 RAF Photographic Competition - Category M People's Choice - SAC Laura Bullas RIGC(NI) - 'Belly Up'. Image was taken from the back seat of a Typhoon T2, by an RAF Photographer during a 6 Squadron sortie as part of Exercise Magic Carpet, Oman.